Ella Rose's and Evie Alice's adventures in South GA and beyond! Today was a much quieter day than we expected. My friend's birthday party got postponed because she's sick. The pet blessing was fun though. Then we headed over to Soccer pictures. We had to wait a long time in the sun, but that was okay. I watched Strawberry Shortcake on Momma's phone. Then we just hung out at home. Momma went grocery shopping and brought both Evie Alice and me back treats. I got striped tights, gummy frogs, and a new Halloween shirt. Ella Rose sure did an she's right it was a quiet day today. We painted and played with our little people babydolls. It was fun. Well the sun has gone to bed and so must we. Today began my fall break and I dressed the part. I wore a sleeveless shirt, white shorts, and striped tinkerbell socks that went up to my knees. Then I picked out my plaid purple shoes. Momma thought I'd picked out an amazing outfit and looked so cute so she had Dados take my picture this morning before we left for school. I just know the rest of fall break is going to be as great as today was. want rather than eggs and toast or cereal. 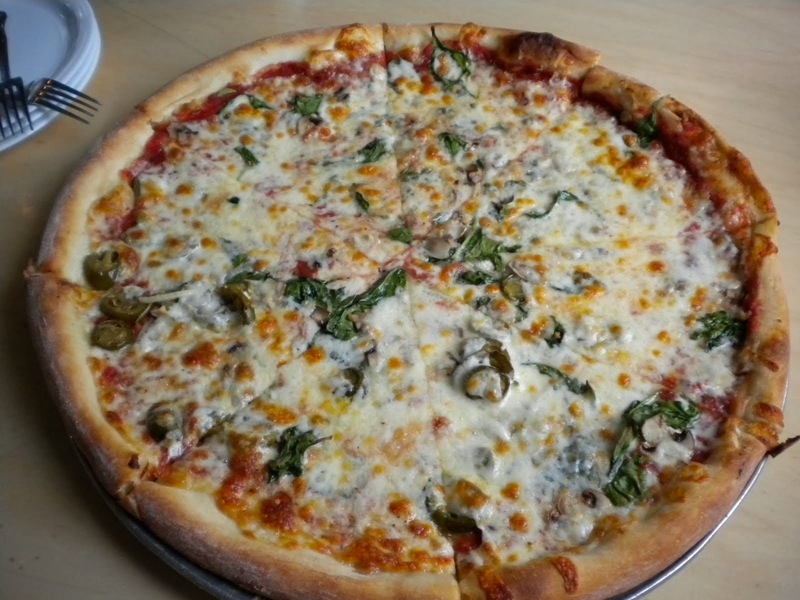 Most days we get veggie chicken nuggets and eggs for breakfast, so pizza is a nice change. I would say the day couldn't get any better, but it did. We got to stay up late and we got to play my UNO game with Grandpa three times today. I just know fall break is going to be fabulous. Ella Rose is right it was a great day today. I got to see most of my friends at gymnastics and had so much fun flipping and bouncing on the trampoline today. However my favorite parts are the rings and the pit. 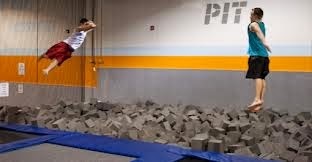 The pit is full of foam blocks and my favorite thing to do at gymnastics is to run down the long trampoline as fast as I can so that it feels like I'm flying. Then I jump in! I did that many times today. It was cool! Then, best of all my best buddy is home for a vacation. I love it when she's here and I can hardly wait to go with her on all our adventures tomorrow. We certainly will keep you posted. 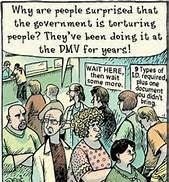 Today Momma took us to the DMV. When she told us we were going to go there, neither Evie Alice or I knew what to think. What is the DMV? It's this noisy place that has vending machines that Momma won't let us buy anything from. The floors aren't good for coloring pictures on, and Momma gets really cranky while waiting there. My tummy was growling and Evie kept crying, but it didn't matter because we waited there a LONG time. Mommy got her picture for her license to drive made and then realized she didn't have any pennies. Now Momma says we are going back there tomorrow. Why do Grown ups play the games they do with their pennies? Evie Alice and I don't want to go back there, but Momma says we have to. I don't think I'll ever understand grown ups. Maybe Momma thought the DMV was fun, but for Evie Alice and me, not so much. Hmmmm...maybe I can make her a driver's license tomorrow while we are at school so she won't want to go back there. I certainly hope I can. Evie Alice here, Ella Rose is right the DMV was not fun! I even threw a fit, but Momma wouldn't leave. Usually, she'll pack me up or threaten to take me to the car, but not today. Maybe I should try harder to get her to leave that DMV tomorrow. What do y'all think? More fits? Running in circles/ I'll have to see what toddler mischief I can get into. 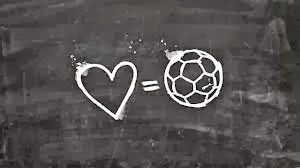 But what was fun, was watching my best buddy play her soccer game tonight. You are right, the soccer game was fun, Evie Alice. But my favorite part of the day was playing Uno. Our whole little family played three games of it tonight and Momma won twice. Dados won the other time. 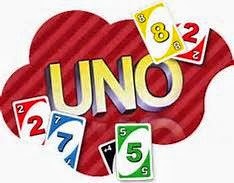 I'm hoping Grandpa will play Uno with me tomorrow. I think I can beat him. No, I know I can! If you are feeling lucky come play with us. It's easy. Even Evie Alice can play and I'm sure Grandpa could always deal you in. Well, Momma is tired to we are off to bed. Waaahoo! 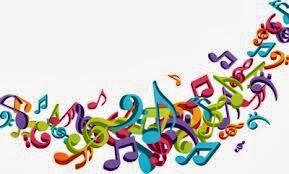 Good morning, it's Ella Rose Today is Wednesday and that means it's Music day at school. It's also my day to turn in my picture money. I had to hold very still for my pictures and that was hard, but all three of my pictures turned out really good. Momma and Dados told me that it was very hard to pick out the best one. I'm really ready for vacation, but I'm looking forward to starting a new movie with Dados today too. We are going to watch Tarzan. I've never seen it, but I hope it's as good as Aristocats was. Momma says Aristocats is one of her favorite movies. Yesterday, Momma took me to the library and I got to renew my library card and check out books. I was so excited. Momma has already ready the puppy book to me twice and we've read two chapters out of the Jasmine book. She says today we can read more. And because it's Wednesday I don't have any place I have to go this afternoon except to visit Grandpa. I love Wednesdays because I get to stay home after school and play with my next door neighbors. My best buddy, Evie Alice is still sleeping this morning. She's been super tired and super cranky lately. Yesterday she even threw a fit at my soccer practice. She was mad because Momma wouldn't let her take her iphone while Momma was trying to take pictures of me at soccer practice. She screamed and screamed. around waiting to go see my friend Maddie. Maddie and I get to play while our Mommas talk. From what Momma tells me both Maddie and I slept in late today. So our play date is a little later than usual. Then I get to go see my Grandpa! I can hardly wait! Well, it's almost time to go to see Maddie. 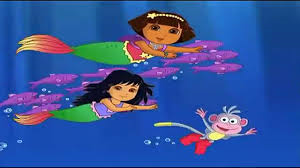 I'm just finishing up watching Dora Rescue's the Mermaids and then I'll be ready to go. I hope you have a great day and we'll talk to you tomorrow. My best buddy and I will. Fall break, fall break, fall break! Evie Alice and I (Ella Rose) have decided that we want to blog every day this month too since Momma told us that she's going to be writing on hers each day. I'm in pre-k now, and can hardly wait for Fall Break. Momma told me this morning we have just four more days until Vacation. I LOOOVVE vacation! Vacations are times that I get to sleep all day, play with my best buddy Evie Alice and my friends next door. I get to go on cool trips and do fun things with Momma. This year it means that I'll get to visit Grandpa a lot more too. I can hardly wait! I'm also going to get to do my homework this afternoon. It's been a few days since I got to do that. I love reading eggs! I am learning to read using it. I can read Sam I am! After I finish my homework I always have to take a rest, but then I get to play with my best buddy, Evie Alice and I love that. We aren't best friends because we have lots of those, we are best buddies. We are the only best buddies that we have. Hi y'all, this is best buddy, Evie Alice! Ella Rose is so right that vacations are fun. I enjoyed my summer vacation so much that I decided to do my school at home this year. Momma and I are looking forward to having my best buddy, Ella Rose home next week too. Momma says we are going to the library today to check out a Dora Mermaid book and I can hardly wait. I have been watching her on the tv until we make it to the library this morning. I love Dora books. I'm going to be a Dora Princess for Halloween. Ella Rose is going to be Ariel. I know all about Princesses. My favorites are Ariel, Rapunzel, Jasmine, Snow White and Belle. I have taken them all to see my Grandpa when we go visit him each day. He's at the doctor today so I can't take them to see him but will tomorrow and I'll take my stuffed Turkey too. We all like Turkey! And I'm Grandpa's girl! It's Ella Rose again. 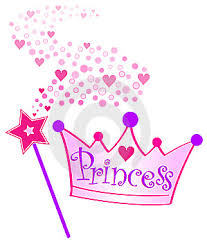 My best buddy and I are going to go play My Little Ponies and Princesses, but we will type to you again tomorrow. 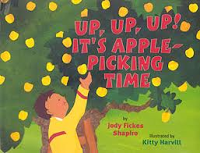 It seems like the only time that I update this blog is right before we go apple picking. Mommy says that we are going to be doing that again this weekend. I can hardly wait! But as excited as I am about picking apples, I'm even more excited about trick or treating! I talk about it constantly. I've decided that I'm going to be Bob the Tomato this year and that my little sister Evie Alice will be Larry the Cucumber. Mommy needs to get working on our costumes! It's going to be so much fun! Something else that will be a lot of fun is going to Gran's house. We are headed up there this weekend and I can hardly wait! I talk to my Gran on the phone every day or at least pretend too. I tell her all about my preschool. I LOVE preschool. We do so many cool things. Each month we have a book fair and I get to pick out books that I like. 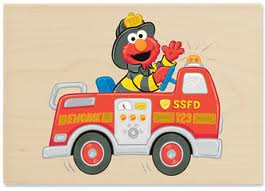 We have had a fire truck visit our school, we've had grandparents day, and a Doodle with Dados (Daddy) day too. Now, we are going to have a fall party! So I'm quite estatic about returning to preschool after the break too. 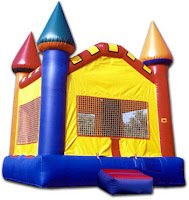 From what I hear we are going to have a bounce house at our fall party and Dados will come to school with me that day so that I can play on the bounce house. Every child has to have a parent with them to keep them safe. Today I got my picture made at preschool. I even smiled pretty!! Not only am I going to preschool now, but I'm still going to gymnastics and now to dance classes too. I'm such a big girl!! I have even begun to talk about turning three. I've told Mommy that I want another Thomas the Train party. She's working on the details for that for me too. I love gymnastics and I'm learning a lot and having a lot of fun at dance too. Evie Alice is getting big too. Mommy and Dados call her their little chipmunk or chunk munk because she's so chunky. Evie Alice has started getting into my toys though and so I'm teaching her baby sign language for no no so that she will know to leave my things alone. After all that's what big sisters do, right? Hopefully I will update my blog again soon! Until then! I can hardly wait until Friday. This Friday my Mommy is coming to my Valentine's Day party at Aunt 'Nise's!!!!! I am so excited. 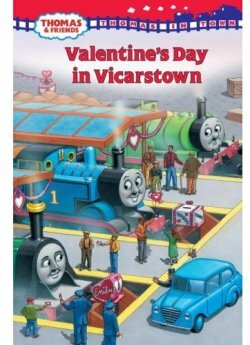 Today Aunt 'Nise gave me a Thomas the Tank Engine Valentine card! You can't get better than that. Mommy is going to look for more of those. What's even better than that is that my Mommy is going to be home with me for the next two months. She's excited about it and so am I. Mommy keeps telling me that Evie is going to come and stay at our home. I'm okay with this. I've talked to Evie in her tummy for a long time now. Evie is going to bring more Mommy's milk when she comes. I've told Mommy that she can stay at our house, wear my old clothes, and snuggle with Mommy, but Mommy can't be her Mommy because she's mine. Mommy has also been planning my Thomas the Tank Engine Birthday party. I can hardly wait. Mommy says that there will be a Thomas train there for me to ride on. I hope that Dados (Daddy) rides on the train with me too. Gran says that she's coming to visit when Evie comes. She's also going to teach me how to put on my own shirts. I already know how to put on my own pants, and shoes. I'm such a big girl!